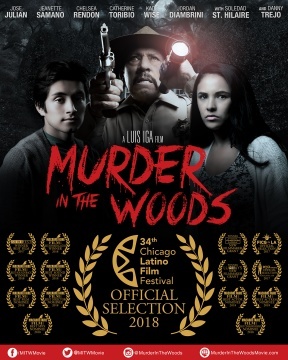 The award-winning horror/slasher film Murder in the Woods, directed and produced by Mexican filmmaker Luis Iga starring José Julián (A Better Life) and featuring distinguished actor Danny Trejo (Machete) has played to packed houses in Los Angeles, New York and Portland thus far and now will have its Midwest Festival Premiere at the renowned 34th Annual Chicago Latino Film Festival (CLFF), home of Latina writer and producer Yelyna De Leon. The film will play on Saturday April 7th at 9:15pm and Monday April 9th at 8:45pm. “I received the news while I was at Sundance and I couldn’t contain the excitement. I want to thank Pepe Vargas (ILCC Founder & Executive Director) and the Chicago Latino Film Festival for being pioneers in reshaping how the world sees Latinos and Minorities in cinema. I’m honored and grateful to be part of this festival and thrilled to have the opportunity to showcase this film to the over 1.9 million Latinos that reside in Chicago” said director and producer Luis Iga. Get your tickets now before they sell out again. They are available here: http://bit.ly/mitwCLFFtktsnikpr For more information on Murder in the Woods, visit www.murderinthewoodsmovie.com.